The FCC posted approval documents on Tuesday for the Motorola M1000. The M1000 appears to be Motorola's first handset for NTT DoCoMo--it was announced back in August 2004 that Motorola would make handsets for DoCoMo. Besides working on DoCoMo's FOMA 3G network, the M1000 works on GSM networks (thus having US FCC approval for a device to be sold in Japan). 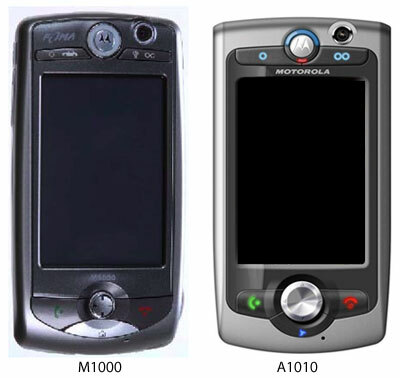 Visually the M1000 looks strikingly similar to the A1010 that was announced earlier this week. Feature wise the Motorola M1000 has: * W-CDMA (3G), GSM/GPRS * Bluetooth * Touch screen * Transflash card slot * 2.9-inch TFT LCD * Twin stereo speakers * Megapixel camera, plus video calling camera * Pre-loaded with Opera for web browsing * Virus scanner A comparison photograph between the M1000 and A1010 is available below.